Paul Menard and the No. 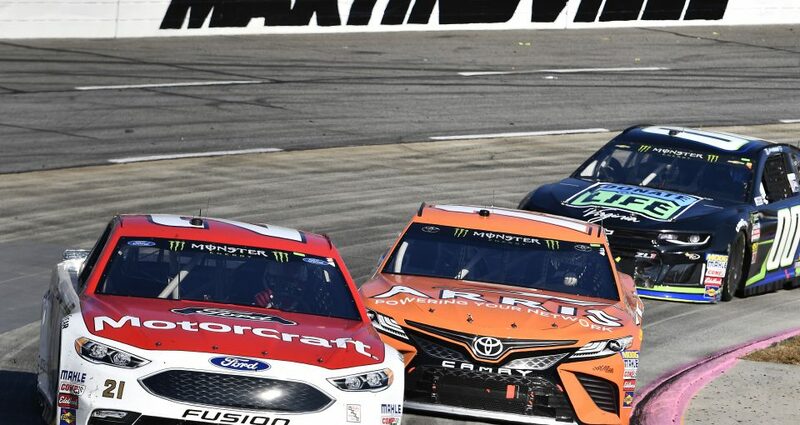 21 Motorcraft/Quick Lane team started Sunday’s First Data 500 at Martinsville Speedway at a disadvantage and were never able to completely overcome it, ending up 22nd at the finish. Menard started from the rear of the pack after experiencing mechanical problems in qualifying that led to an engine change between Saturday’s qualifying session and Sunday’s race. He quickly drove his way forward into the top 25, and despite starting from the 38th position he was able to remain on the lead lap for more than 175 mostly green flag laps. The team’s early-race progress was stymied by a poor pit-stall selection, and he often had to back up prior to leaving his stall, losing any chance to gain spots on pit road. Still, the team continued to adjust on the No. 21 Fusion, and Menard maintained his spot among the top 25. Midway through the race, during a long stretch of green-flag racing, Menard fell two laps behind the leaders but made up one of them by taking the wave-around when the race’s final caution flag flew at Lap 458 of 500 for a spin by Clint Bowyer. From then on to the end of the race, there were no caution flags and therefore no more opportunities to use strategy to rejoin the lead lap. “It was long day,” Eddie Wood said. “We got behind on our adjustments midway through the race, but we got it back later on. The finish dropped Menard one spot in the points standings to 20th place, five points behind 19th-place Ricky Stenhouse Jr., with three races remaining in the 2018 season.